None of the body systems is capable of functioning alone. All are interdependent and work together as one unit to maintain normal conditions, termed homeostasis. The nervous system serves as the chief coordinating agency for all systems. Conditions both within and outside the body are constantly changing. The nervous system must detect and respond to these changes (known as stimuli) so that the body can adapt itself to new conditions. The nervous system has been compared with a telephone exchange, in that the brain and the spinal cord act as switching centers and the nerves act as cables for carrying messages to and from these centers. Although all parts of the nervous system work in coordination, portions may be grouped together on the basis of either structure or function. Figure 5-1 Anatomic divisions of the nervous system. 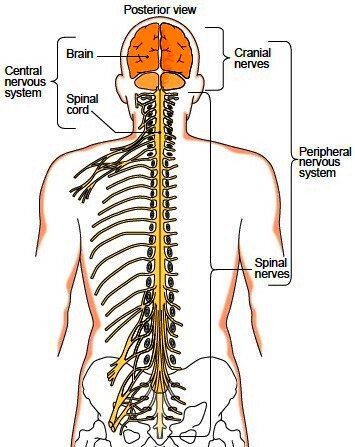 * The central nervous system (CNS) includes the brain and spinal cord. * The peripheral nervous system (PNS) is made up of all the nerves outside the CNS. It includes all the cranial nerves that carry impulses to and from the brain and all the spinal nerves that carry messages to and from the spinal cord. The CNS and PNS together include all of the nervous tissue in the body. Functionally, the nervous system is divided according to whether control is voluntary or involuntary and according to what type of tissue is stimulated (Table 5). Any tissue or organ that carries out a command from the nervous system is called an effector, all of which are muscles or glands. The somatic nervous system is controlled voluntarily (by conscious will), and all its effectors are skeletal muscles (described here). The involuntary division of the nervous system is called the autonomic nervous system (ANS), making reference to its automatic activity. It is also called the visceral nervous system because it controls smooth muscle, cardiac muscle, and glands, much of which make up the soft body organs, the viscera. The ANS is further subdivided into a sympathetic nervous system and a parasympathetic nervous system based on organization and how each affects specific organs. Although these divisions are helpful for study purposes, the lines that divide the nervous system according to function are not as distinct as those that classify the system structurally. For example, the diaphragm, a skeletal muscle, typically functions in breathing without conscious thought. In addition, we have certain rapid reflex responses involving skeletal muscles- drawing the hand away from a hot stove, for example-that do not involve the brain. In contrast, people can be trained to consciously control involuntary functions, such as blood pressure, heart rate, and breathing rate, by techniques known as biofeedback.